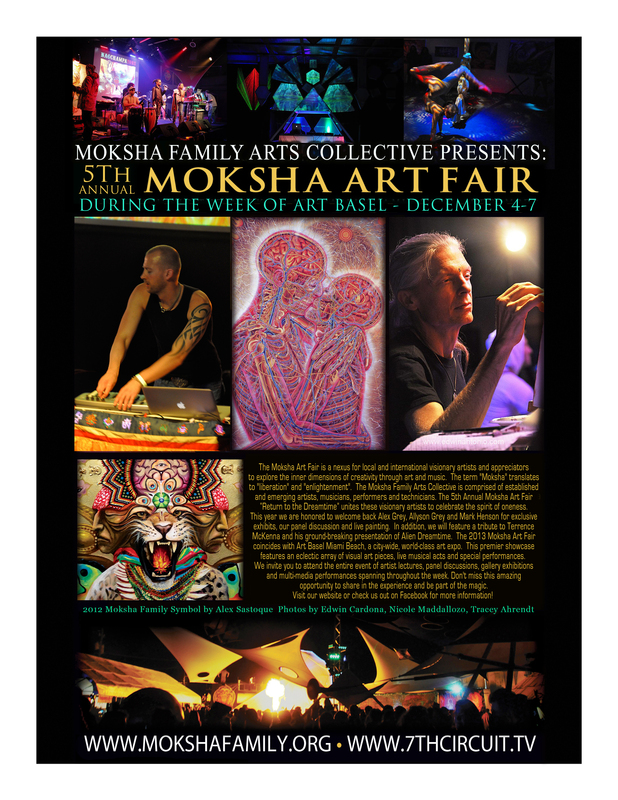 On Wednesday, Dec. 4th, 2013 The Moksha Family Arts Collective will be opening the Moksha Art Fair Gallery Exhibition “RETURN TO THE DREAMTIME” featuring local & International Visionary Artists during the week of Art Basel Miami Beach. FREE..
Wednesday, Dec. 4, 2013 – 6 p.m.
FREE admission. All ages admitted. & Love the Everglades Movement. FIU Professor Constantino Manuel Torres – Archaeologist and Ethnobotanist specialising in the ethnobotany of pre-Columbian South America and the Caribbean.” Allchemical Arts, A Personal Adventure with Terrence McKenna”. Debut of the new Moksha Symbol created by Randal Roberts. Lectures & Panel Discussion & Film!! 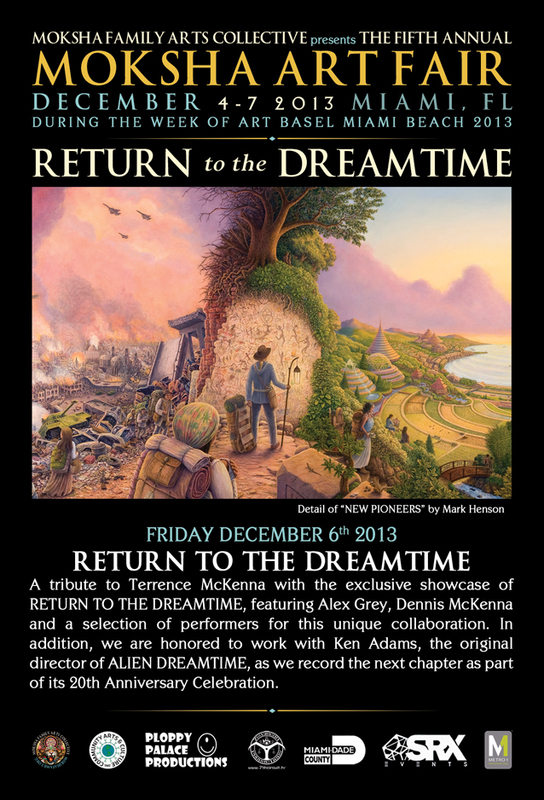 A Tribute to Terence McKenna and a celebration of the 20th Anniversary of “Alien Dreamtime”. This special presentation features a collaboration of world-class visionary artists and musicians in a once in a lifetime showcase. The event starts with an insightful reading from Dennis McKenna, ethno-pharmacologist and author, sharing passages from his book, “The Brotherhood of the Screaming Abyss”. Next there will be an introduction and screening of Ken Adams’ new film “The Terence McKenna Experience”. Ken Adams is the original producer of the ground-breaking film “Alien Dreamtime”. 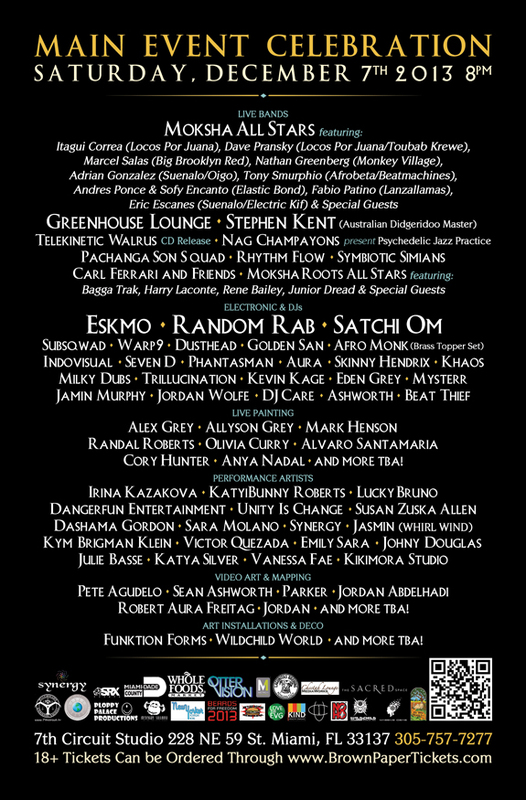 Now as part of the 20th Anniversary of this distinctive film, we are honored to present the sequel to this exploration of entheogenic awakening. .
For the live presentation and recording of “Return to the Dreamtime”, we are honored to feature, visionary artist and orator, ALEX GREY, electronic musician and producer, RANDOM RAB, and Australian didgeridoo master and multi-instrumentalist, STEPHEN KENT, in a historic showcase that will be filmed by Ken Adams and the Moksha Family Arts Collective. In a fusion of dynamic sights, sounds and thoughts, “Return to the Dreamtime” will channel the legacy of Terence McKenna for the next chapter ethnogenic awakening and the on-going saga of societal evolution. ALEX GREY will recite some original written pieces and share insights into exploring consciousness and artistic expression, while RANDOM RAB and STEPHEN KENT blend their eclectic tones and syncopated tempos with an improvised flair! To enhance the transcendental experience, state of the art video mapping will project ALEX GREY & ALLYSON GREY’S ultra-sensory artwork across an eclectic landscape of shapely fabrics stretched throughout the entire facility. Don’t miss this unique opportunity to experience history in the making! Advance tickets are $30/$35 at the door. 18 and over. 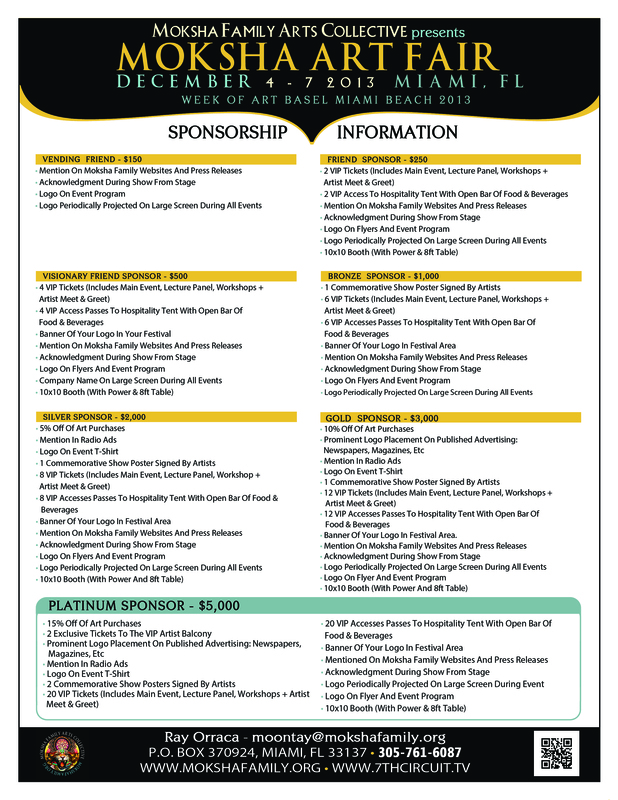 The 2013 Moksha Art Fair coincides with Art Basel Miami Beach, a city-wide, world-class art expo. This premier showcase features an eclectic array of visual art, live music and distinctive presentations. The 5th Annual Moksha Art Fair “Return to the Dreamtime” refers to Aboriginal mythology that aligns consciousness and communal connections through plants, animals, locations and certain tribal rituals. 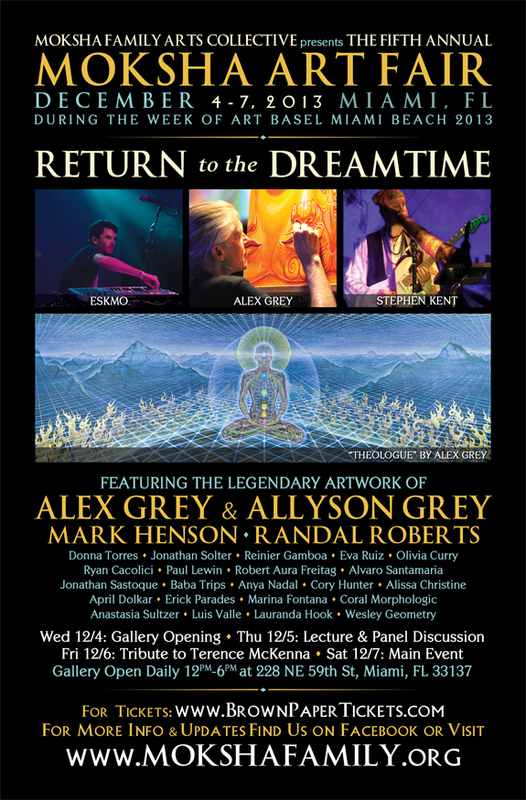 This year we are honored to welcome Alex Grey, Allyson Grey, Mark Henson, Randal Roberts and other national and international artists for exclusive exhibits, panel discussions and live painting. In addition, we will feature a tribute to Terence McKenna and the 20th Anniversary of his ground-breaking presentation of “Alien Dreamtime”. The Moksha Art Fair is a nexus for local and international visionary artists, collectors and admirers to explore the inner dimensions of creativity through art and music. The term “Moksha” translates to “liberation” and “enlightenment”. The Moksha Family Arts Collective is comprised of established and emerging artists, musicians, performers and technicians. Don’t miss this amazing opportunity to share in the experience and be part of the magic! We invite you to attend the entire event: artist lectures, panel discussions, gallery exhibitions and multi-media performances throughout the week. Featuring musicians from South Florida’s top bands, including- Itagui (Locos Por Juana), Dave Pransky (Locos Por Juana/Toubab Krewe),Tony Smurphio (Afrobeta/Beatmachines), Andres Ponce & Sofi Encanto (Elastic Bond), Fabio Patino (Lanzallamas), Adrian Gonzalez (Suenalo/Oigo), Eric Escanes (Suenalo/Electric Kif), Marcel Salas (Big Brooklyn Red) and special guests! Featuring Bagga Trak, Harry Laconte, Rene Bailey, Junior Dread & special guests! Advance tickets are $40/$50 at the door. 18 and over. Advance Discount Tickets Now On Sale! Moksha Art Fair is made possible with the support of the Miami-Dade County Department of Cultural Affairs, the Cultural Affairs Council, the Miami-Dade County Mayor and the Board of County Commissioners.